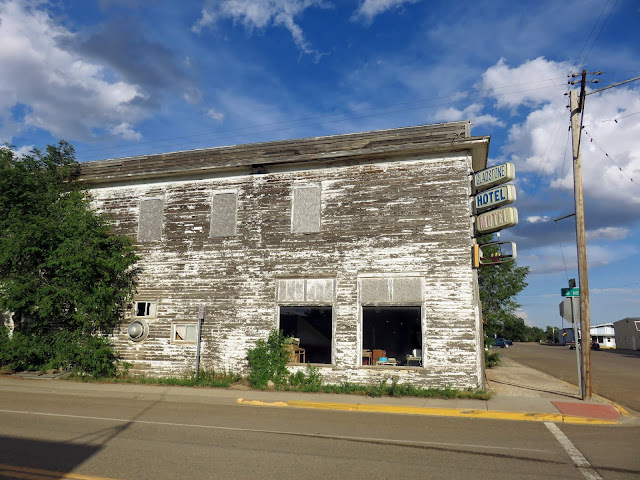 The Gladstone Hotel in Circle, Montana. One of the few remaining original buildings on Circle's main street, the Gladstone Hotel welcomed its first guests in the new town on Christmas Day of 1915. Just over a year before, Circle town lots first went on sale. Built to serve travelers on the promised Great Northern Railroad, the Gladstone would wait 14 years to fulfill that duty. Meanwhile, homestead families moved steadily into this part of Dawson County, and McCone County was created in 1919. The hotel has seen many uses over the years. In the great influenza epidemic of 1918-1919, it became the community hospital, with one room reserved as morgue. During World War II, its restaurant was a gathering place for those awaiting radio news from the fronts. The Gladstone's original "high class bar" never reopened after Prohibition ended, but since has been used for many a private party. And, the hotel also became a retirement home for some of the community's elders. 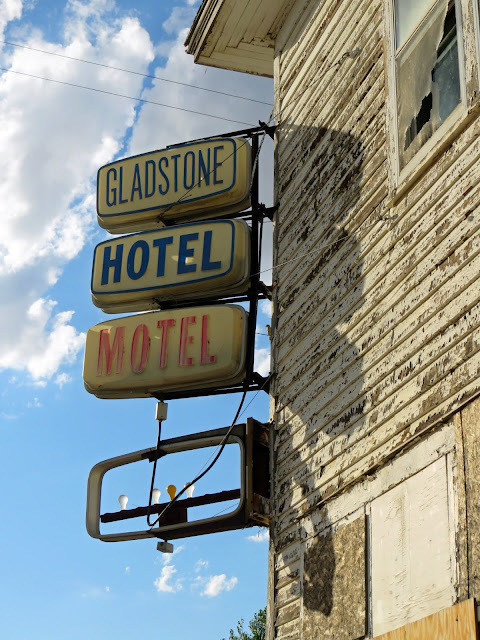 Originally built with 20 sleeping rooms, the Gladstone received a 10-room addition in 1948 when oil development raised expectations of a new boom for Circle. Most of the windows were boarded up, with the exception of the two front windows, one of which was broken. I stuck my hand in to take a picture of the inside, which looked vaguely like the lobby of an old hotel. It smelled like a musty old building. Even with a broken window, it was clear that no one was taking anything from the place. The town's estimated population as of 2014 was 609 people. I'm guessing if anyone bothered to steal anything, they'd know exactly whose house to go to. A must read I was very worried about giving all my information online. The compares hotel pricing were extremely friendly websites, knowledgeable, and made the entire experience enjoyable.